Product #21736 | SKU NYS-SPP-L1 | 0.0 (no ratings yet) Thanks for your rating! 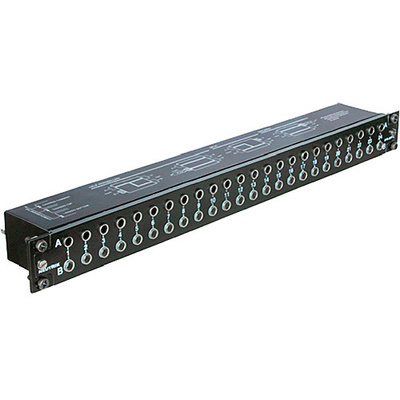 The Neutrik Modular 48-Point 1/4" TRS Balanced Patch Bay is a single-unit 19" rack mountable patch bay in a reinforced metal housing. The patch bay has 48 PCB channels in 24 front pairs and 24 rear pairs. Each pair can be grounded separately or in groups according to your preference by simply attaching the supplied grounding clips to the grounding pad of the corresponding channel. The PCBs are clamped without bolts or nuts between the front and back panel of the rack enclosure. The patch bay is designed with improved non-tarnishing contacts to minimise long-term wear and flippable PC boards that make it easy to reconfigure. The device features a grey-coloured normalling jack that is easy to identify and connect with when wiring the unit for normalled, half-normalled, or isolated configurations.